Have you ever stopped to think about how much time you spend in the car with your kids? 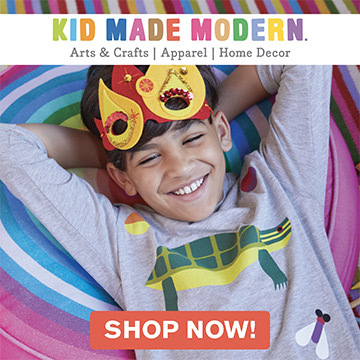 Between school, running errands, drop-offs at slumber parties and all the little stops along the way, you’re talking about a serious chunk of your family’s day. With that in mind, we devised a plan to turn car time into awesome time. Our aim was to get the kids looking out those windows and discovering the big, bright and incredible world we live in. 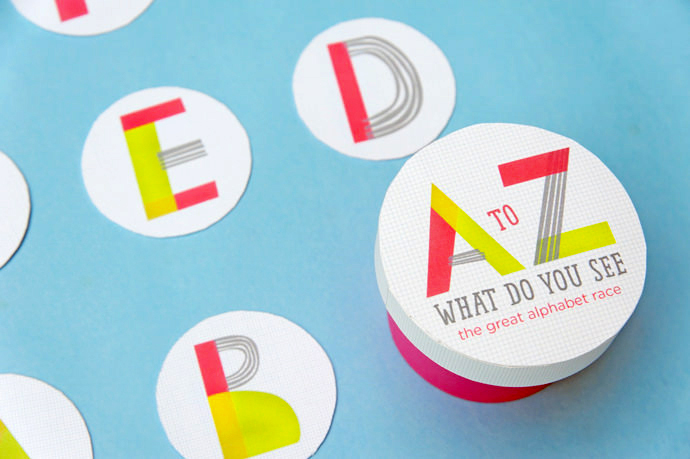 After a few brainstorming sessions around the kitchen table, we ended up with a simple DIY travel game that will have the entire car discovering, reading and engaging with each other (instead of begging for your iPhone). A to Z: What Do You See! 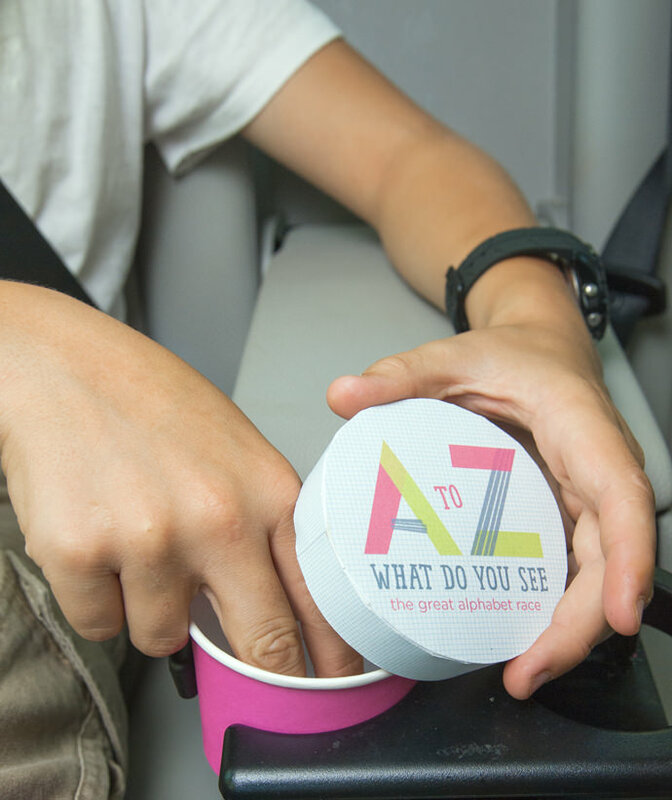 is a backseat game that fits neatly into your child’s cup holder and takes car games to the Alpha Level. 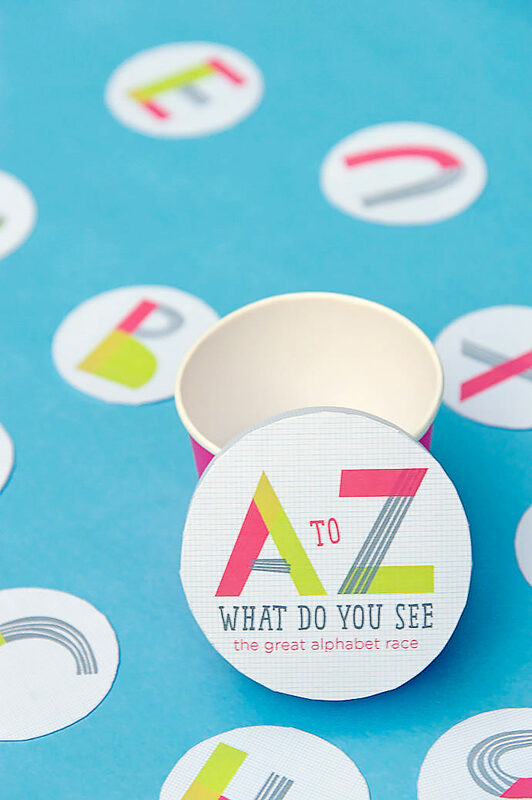 To get started, simply print out and assemble the A to Z tokens and cups for each child and let the games begin! 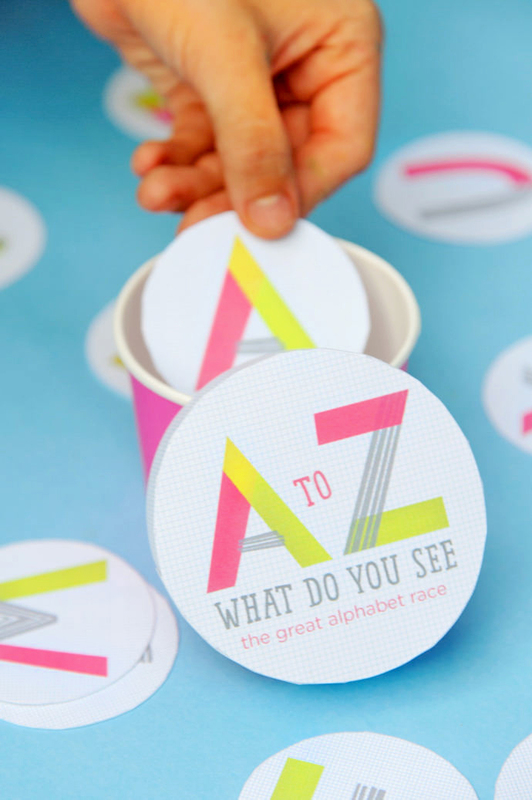 Download and print the A to Z: What Do You See! printable. 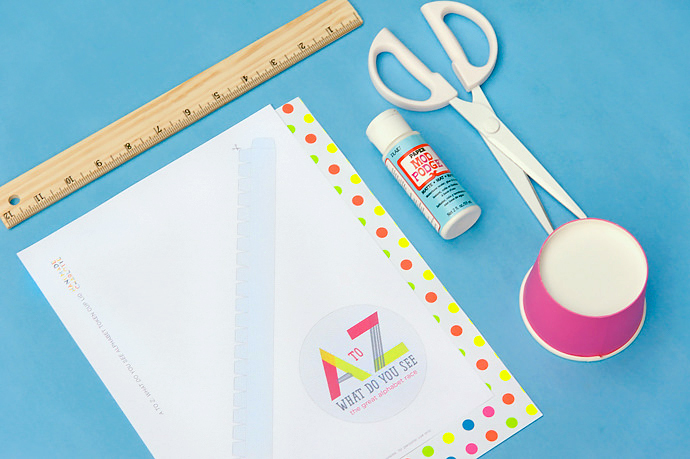 Instruct your kids to cut out and assemble their A to Z cups with the scissors and glue stick. 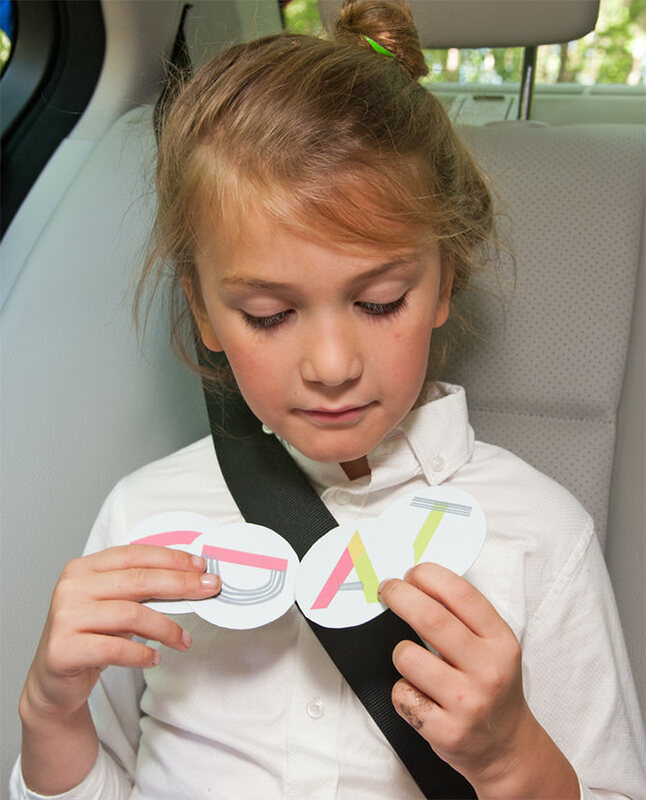 Once you’re in the car, Mom or Dad begins the game by pulling a letter from the stack and passing it around to all the players (aka your kiddos). Whoever spots that letter from outside the window first (from billboards, license plates, buildings, signs, etc.) gets to put that token in their cup. At the end of the car ride, everyone counts their tokens and the player with the most wins! This game is great for short and long car rides. When it’s just me and my six-year-old, we like to play a time trial version to see how many letters she can spot from the time I pick her up from school until we pull in the driveway at home. It’s endless fun! this is so cute! But I don’t think the link to download the prints is working! I can’t download the printable! I can’t find the link. Please help! Sorry, the link is fixed now! Thanks for the great marks! The hand lettered type put this DIY over the moon. Our kids play it every time we jump into the car. We loved getting the chance to work with Ford on this project. Thanks for taking the time to send your sweet note. Yes, it is hand lettered type. Our art director Addie created it specifically for this project. 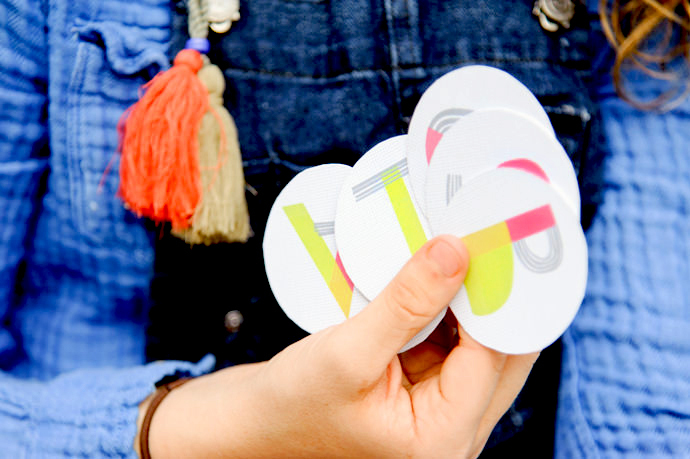 The game is really fun and we’ve enjoyed getting to know type all over Atlanta. Thats a great idea. Thanks so much for sharing! No wonder I love the design so much! It is beautiful. Oh my goodness, I LOVE that it fits in the cupholder! Could there be a prettier game? My kids would love this and we take some pretty darn long car rides so this will come in super handy for us, thanks!! we love playing the alphabet game in the car!!! This would make it so much MORE fun!!! Fun! Where did you get your ice cream party cup?